Thanks to the vision of Membership Committee Chair Sean Fredrickson, we’ve developed the first Pacific Northwest Section Mentoring and Networking Conference. The objective: Provide PGA Apprentices and Assistant Golf Professionals with the tools, relationships, and perspectives they need to be successful PGA Professionals by connecting them with industry leaders who will share their experiences on achieving success in the golf profession. Designed specifically for fairly new apprentices, this is not your typical education seminar. 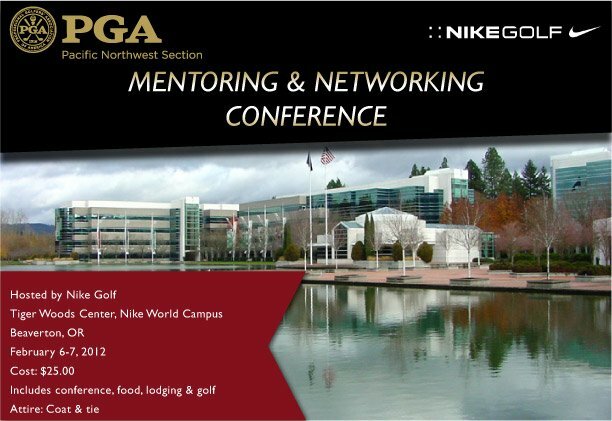 You’ll spend time discussing current topics affecting the golf business and your career with fellow professionals and veteran leaders in the Section. Thanks to Nike Golf, who will be picking up the tab for the hotel and hosting us at the Tiger Woods Center, this workshop will cost only $25 for participants. Click the image below to register or for complete details. 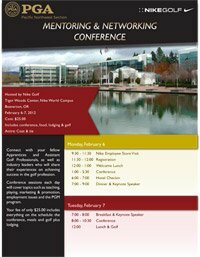 Questions: Call Sean Fredrickson at Tualatin CC 503-692-4620 or Jeff Ellison 800-688-4653.